But they are not the only company that makes them. 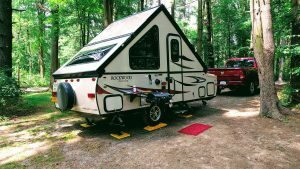 The a-frame design has been around a long time and several companies make them, all with their own set of customizations. Another company called Chalet makes very similar models out in the Pacific Northwest, which, incidentally, is where the A-Liner company originated. They are popular, noted for high quality and are found predominantly in the west. Our local RV dealer carries A-Liner, but only had two small, low-end models on their lot. It seemed like their heart wasn’t really into selling them. Looking online, I found a few others around New York, but not a lot. But what I did find, still not in any great numbers, but at good prices and with some featured that I liked, were the Forest River products. Now Forest River is probably the biggest RV manufacturer in the world. Look at the names on trailers and RVs you see going down the road, and if you do a little research, they are all made by divisions of Forest River. 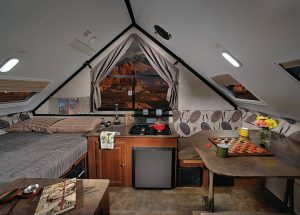 Coachmen Clipper, Palomino, Viking, Rockwood, and Flagstaff are all sub-brands of Forest River that offer the a-frame models. Rockwood and Flagstaff models actually roll off the same assembly line. 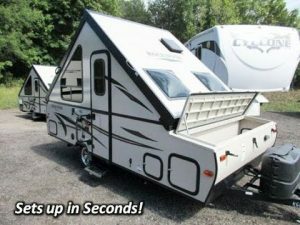 A similar company, Jayco, not part of Forest River also has a-frame campers. None of this was obvious to me at first, but in doing research to see what models I wanted and where I could buy one, I learned a lot. 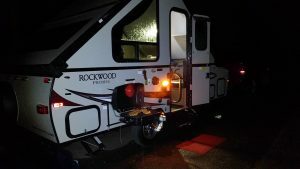 I ended up looking for a Rockwood A122S, which is a little bigger than the smallest A-Liners, but otherwise was very comparable. The big feature that I found they offered, but A-Liner didn’t (They did in the past, but not current models) was a large storage compartment in front of the cabin. It’s entirely separate and accessible only from the outside. Great for carrying all the things you lug along, but don’t need to take inside with you. When the time came to buy, there was only one in New York state, at a dealer near Elmira. There were more, of course, in Ohio and Pennsylvania, but for the sake of simplicity in registration, I started in NY. I woke up early on Saturday, and decided to go for a ride and see it. I ended up buying it. My previous car, while it had a hitch, was only rated for 1500 lbs. This trailer is in the 2000+ lb. range empty. Not gonna work. I knew I would need a bigger vehicle and had been shopping for a bigger SUV or pickup truck. I ended up getting a 2014 RAM 1500 with a 5.7L V8. A little overkill, maybe, but keeping in mind that a larger RV trailer could be an option in the future, it seemed like a good idea. The truck had a ball on it’s bumper when I got it, but I converted it to a receiver hitch right away. When I got the trailer, the dealer installed a brake controller as well and it tows like nothing is behind me at all. Okay, so how do these things work? They fold up flat like a tent pop-up, but there is no canvas, no pulling out sliding beds, etc. They are very roomy in ceiling height in the middle and the low ends are where you would be sitting or lying down anyway. Here’s a You Tube video that shows how it goes up and down. It’s the model without the front storage compartment, but otherwise, the same. Where it really shines is set up and fold down. One person can do it in less than a minute. They say thirty seconds, but that doesn’t count leveling. The longer panel rises up, bungee cords help pull up the other panel and they lock together at the top into the teepee shape. Then you step through the doorway, which is like a Dutch door, so you can open the top and bottom independently, and lift the front triangle up. It nests into the two roof pieces and two locking levers finish the job. You repeat with the rear triangle and you are done. Period. That’s all there is. 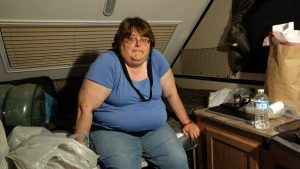 Well, you do have to put down the stabilizer jacks and level the trailer and do all your hookups, but you are literally able to step inside and sit down as soon as the walls are up. I had a Palomino tent pop-up camper some years ago and this is just as roomy inside. The tent-style pop-up was a lot harder to set up. I could do it myself, barely. There were arms that were spring loaded and if you slipped and dropped the top in the middle of raising it, you could damage the trailer or yourself. It really needed two people to do safely. The A-frame, my wife could set up. Inside our camper. You can see the two locking levers holding the walls together. Once the rain let up, we could cook outside on the grill. It was 9:30pm. We picked up the camper at the dealer, south of Elmira. We didn’t know how long it would take, so we planned on staying the night in it somewhere in the area. If there was a problem, we’d still be near the dealer for help. 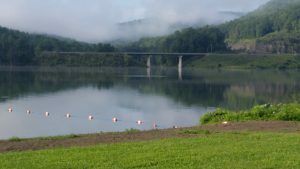 I found a place called Tompkins Campground, which is part of the Cowanesque Lake Army Corps of Engineers area. Sites with full hookups were only $40 and just electric, like we needed, were $38. I used my National Parks Senior Pass and got half-off. We found the campground, but couldn’t check-in until 4pm, so we went looking for a place to get lunch. We wanted to buy some groceries too, so I searched for a WalMart. There is always a couple of restaurants nearby. We finally found a place where the GPS could get enough signal to search for a WM and found we were less than 10 miles from one in Painted Post. Off we went for lunch and shopping. We went back to the campground and checked in just a little after 4pm. We got to the site and started having fun setting up. Everything went smoothly and we had no problems. It was hot and humid and by the time we got done, just fired up the AC and sat there and cooled off. Eventually, we recuperated, and went outside again. I decided a fire would be nice and went to see if they sold firewood. By the time I got back to the office, it was closed. So I went back to the campsite. On the way back, I spied a place where there was ice and firewood available. It was honor system, and firewood was $5 a bundle. or 5 for $20. I figured, one, maybe two bundles would do, but all I had with me was a Twenty. So, 5 bundles it was. Maybe I could give some away. I set to starting a fire and found a previous camper had neatly stacked 3 or 4 pieces of firewood behind the fire ring. They were charred, but almost whole. I started out with them, found some paper to light it with, (some of the cardboard box the grill came in) and sticks and twigs. And pine needles and cones. The trees around were pines and the ground was covered with a bed of needles. Pine cones were everywhere too. The needles are good fire starters and the cones burn well with a lot of sap to keep them going. It took a while to get the larger logs going, but before long, it was a good campfire. Standard Boy Scout stuff. Then the rain came! At first it was light and refreshing. The little bit that filtered down through the trees felt good after the heat and humidity. By heat, I mean it was mid-80’s, not totally a scorcher, but combined with the humid air, it was uncomfortable. But then the rain started to fall in earnest, and we picked up our folding chairs and tossed them under the camper to stay dry. I pulled a tarp over the remaining firewood in the back of the truck and we went inside the trailer to wait it out. And wait we did. When it got to 9 o’clock and our stomachs were growling, we decided we’d better find a way to eat. We had bought some pre-marinated chicken breasts and planned on grilling them. The grill was out in the rain. We didn’t have a single cooking pan with us yet, so the stove wasn’t an option. We considered the microwave, but decided against that. I even suggested eating breakfast and saving dinner for the next day, but then decided to brave the rain and cook on the grill. The closest thing I had to rain gear was a hoodie, so I put it on and fired up the grill and threw the chicken on. The rain began to let up, so at least it wasn’t a downpour anymore and I didn’t get soaked. The chicken was successfully cooked, and we had it along with some Amish Macaroni Salad from the store. Not lavish, but good and did the job. Through the thunder and lightning and what was really a heavy rain for a couple of hours, the trailer did a great job of keeping us comfortable and dry. 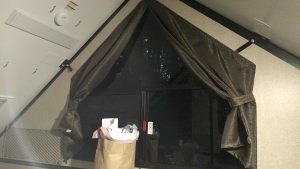 There was not one sign of a leak anywhere, which is something I would not expect with a canvas-side tent camper. Something always ends up soggy, but we were safe and dry and enjoying the air conditioning and light. We realized we didn’t have much to do to pass the time, though. We wished we brought a deck of cards! I settled for playing music on my laptop through the JBL Charge 2 bluetooth speaker. There is a stereo built into the camper, but I couldn’t figure out how it worked and it has an outside speaker and I could never be sure it wasn’t blasting the whole outdoors, so I avoided using it. Who ever thought it was a good idea to put speakers on the outside of RVs should be banned from every campground on the face of the earth. It’s a dumb idea. I’m sure it can be turned off and only the inside speakers used, but this thing that looks like a car radio was so non-intuitive that I didn’t have the patience to figure it out. So, we turned in for the night early, maybe 10:30 or so. I think we were tired, but not quite accustomed to the trailer, so it took a while to get any sleep. 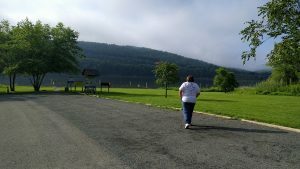 I know we each made a couple runs across the road to the restrooms. But I finally slept until daylight woke me up again. A bigger pillow would have helped. We forgot to bring any regular pillows and only had a couple of small travel pillows. Our plan was to take the day and visit the Corning Museum of Glass. Bobbi had never been there and I hadn’t been there since I was a kid. I don’t know if it’s even the same building because it was unrecognizable from what I remember. We got up and had our breakfast. Breakfast pizza squares in the microwave and bananas. Then we took a walk around the campground and down to the beach and boat launch. Lifejacket loaner station. I don’t know how you can swim in a lifejacket, but they are there. The beach was a man-made beach. Trucked-in sand and a concrete pad in the water. The entire lake is a flood-control project run by the Army Corps of Engineers. Probably as a result of the flood in 1972 that had the whole area flooded in the valleys. We took our time, but it didn’t take very long and we were packed up and ready to go. You get in that mode where whatever you do, whatever you touch, you go towards the goal of packing up. You use something, then put it away where it has to go. Before long, we were ready to fold up the trailer and hook up and go. It went back down as easily as it went up. The process is so simple and easy, it’s a breeze. We drove to Corning and the Museum of Glass, and spent the day, had lunch and walked around their Gaffer District. A pretty town, but I’m not going to tell that story now. Besides, I left my phone in the truck and have no photos to show for it, just memories! We could have spent more time in Corning, but I think we were tired from the lack of a good night’s sleep, We headed home and got back to Lockport around 4:30pm. Did about the minimum to put things away and crashed. It was another early turn-in night, but we slept good back in our normal beds. The camper has been a success. I’ve not used as much as I would like, but there will be time for that. Where have we been with it? 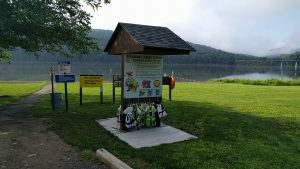 We went to the Adirondak Mountains and spent two days at a state campground called Limekiln Lake. It’s in the Old Forge area. We enjoyed that. Then we went straight to the St. Lawrence River and stayed in another state park, Jacques Cartier SP. It was right on the river and you could look across at Canada. We were a short walk from the river banks. It was really a beautiful park and we would have liked to spend more time there. I’m forgetting the order of things, but we also went to Hamlin Beach SP just this side of Rochester and had a good time. We’ve found that to be comfortable, all our trailer really needs is electric. Water etc. isn’t a big deal, but the A/C is really nice. I have a generator, but you don’t want to run it all of the time and many state parks limit the use of generators. In an ongoing project, I added 200 watts worth of solar panels and a second battery. I really haven’t put it to the test out camping yet, but it keeps the battery topped off while stored in my side yard. Until fall came and it’s in the shadow of my house all the time. I took one solo trip with the trailer back to the ADK. I free-camped in a wilderness area called Moose River Plains. It’s public wilderness land along the Moose River. It’s first-come-first-served and way off the beaten track. Not far from Limekiln Lake and we had checked it out when we were there earlier. Limekiln was closed, but there is no season in the wilderness area. I found a site about five miles into the area. It’s just logging roads and you have to drive about 10mph tops, so it seems like you’re 25 miles in. The spot I set up in was wooded and I couldn’t get a lot of benefit from the solar panels, but you could run the generator 24/7 if you wanted. I just ran it occasionally to top off the battery. The reason I went up was we were having a heat wave and I wanted to escape the 90 degree heat. Guess what, it was almost just as hot there! I didn’t mind it except when I did anything at all, I got soaked with sweat. Just like home. But the nights were glorious! I have never seen the stars so bright, not even up in Maine. I just stood in the road in front of my campsite looking up at them until my neck hurt. Night time was cooler and it was quite nice to sit by a fire and relax. I bought firewood a couple times down on the main road and got a good fire going that I kept up all night hoping to keep bears away from me. It must have worked. (Kidding) I saw very little wildlife, actually. Didn’t even hear birds except one call I kept hearing at night. The only bird I saw in the distance was on the dirt road driving in. It might have been a big crow or raven, or maybe something bigger. I didn’t get close enough to really find out. But not a squirrel, or chipmunk, or raccoon. Certainly no bear or moose, although the area is supposed to home to moose. Kind of weird, actually. Anyway, since it was so hot during the day, and I got really bored, I only stayed two nights and came home. I can be hot at home. That’s it so far. I’ve spent a lot of time in it in my yard, working on little improvements and just hanging out in it. It’s like a little man cave and is pretty comfortable.